I have a confession to make. It's not like a super bad confession, just something that I have hidden from you, my dearest readers, for longer than seems necessary. I, Deborah Pless, adore the Mrs. Murphy Mystery series. I know, I know. Shameful. Or maybe not? It came to my attention last week when I raced through the most recent installment of the series that my shame about these books and my reticence to talk about them could actually be completely unfounded. I figured I had nothing to say about a series that has been one of my favorites since I was a little kid, but when I think about it, I do have things to say. Plenty of things. Starting with the simple admission that I love them. 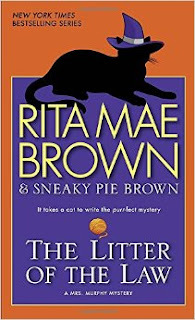 For those of you who are unfamiliar (most of you, I'm guessing), the Mrs. Murphy Mystery books are a series of over twenty mystery novels written by Rita Mae Brown and co-authored by her cat, Sneaky-Pie Brown. That's right, these are cat mystery novels, and the books themselves are told from the perspective not of the humans but of their pets. The main character in the series is Mrs. Murphy, a sleek tabby cat who belongs to Harry Harristeen, a woman with a serious nose for trouble. 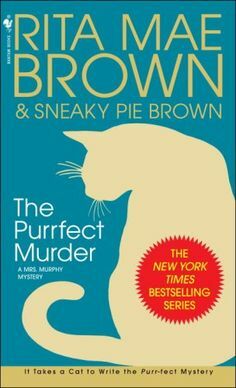 Alongside Harry's other pets, Tee Tucker the corgi and Pewter the incredibly fat gray cat, Mrs. Murphy helps solve whatever murders come through their small Virginia town of Crozet. And after twenty odd books, that's a lot of homicide. The books, which like I said I've been reading since I was about eight, span decades of life in Crozet and follow Harry through some big life events. 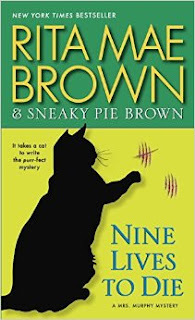 While each book does contain a gruesome murder that Harry inevitably stumbles upon and accidentally solves (with the help of her pets), the series is really more about the life of the town. Harry starts the series as the Crozet post-mistress, a job she has taken up after her divorce from her husband, Fair. She's angry and bitter and still healing, and slowly makes some new friends in town, starts dating, and gets back into the world. Also there are murders and stuff. By The Litter of the Law, the one I just finished which came out last year, Harry and Fair have reconciled and are remarried now, living happily on her family's farm. Harry is a small-business farmer instead of post-mistress, and she's even survived a bout of breast cancer. Like I said, the series is really more about the characters in this town than the murders they keep stumbling on. Which is a good thing, because the murders themselves aren't that well done. Or rather, they are well done, but after you've read ten or so of the books, it's super easy to figure out who is and is not a suspect. Harry, Fair, and the rest of the regular characters are never going to be legitimate suspects. So any new character introduced in the book is apt to be either a suspect or a victim. It's not a terrible problem, but it's also not insignificant. The mystery part of the books is rather lacking. But should that matter? Clearly it doesn't matter to me, at least not enough to make me stop reading the series. For all that I have the critical analysis skills to tear these books to shreds, I don't. I know that there are long passages on farming and huge bulks of exposition that are not overly well worked into the story. I don't really care about the ins and outs of irrigation in sunflower fields or which varieties of corn grow best, but I do care about Harry. So I put up with pages on pages of hokey dialogue and completely irrelevant information because I love these characters and I want to see what happens next in their lives. Harry feels like an aunt to me. Not an aunt I'm particularly close to, but a sort of distant relative you keep up with on Facebook. I'm invested in her happiness. I want things to work out well for her, and once a year or so I pick up the latest book to see what my aunt Harry is up to and how the animals are doing. It's comfortable and comforting, and maybe that's why I've never talked about it before. I sometimes have trouble seeing the value of media that is simply comforting. I mean, my favorite films are always ones that challenge and innovate. I love stories that are brutal, that punch me in the gut. My best friend and I always joke that there's something wrong with me, because I watch Criminal Minds and war movies to decompress. I have trouble seeing the worth in something that makes no pretensions about being art. They're just stories, and I forget the importance of "just stories." But "just stories" really are very important. They're the media that arguably has the most impact on us because they're the media that we consume least critically. I'm fortunate that my "just stories" books happen to feature a strong female protagonist who never lets go of her agency and self-determination, but that could have easily not been the case. I mostly fell on these books because they have cats on the cover and I really like cats. I guess what I'm saying is that I'm sorry. I'm sorry for discounting a section of media because it doesn't fit my narrow definition of what is worth discussion. It's elitist of me to ignore the segments of media that exist purely for entertainment and that don't want further analysis. On the one hand, I think that makes them even more worthy of analysis, but on the other hand, I want you to know that it's okay if there are stories in your life that you don't want to think too hard about. Stuff that's just comfortable and comforting. Junk food stories. That's okay. I have that too. And maybe if we're all a little more honest about our junk then we'll all feel better. So tell me what your junk is in the comments! I know I'm not the only one. Fess up. I was an English major, and during the first couple years of school I felt massive amounts of shame that my two favorite books are Ella Enchanted and Howl's Moving Castle. They're light, fun reads that I adore. Ella Enchanted, in particular, is probably the reason I love reading and writing so much. I picked it up in fifth grade and have re-read it too many times to count at this point. When I was interviewing to be on the review committee for my university's creative writing journal, they asked me what my favorite book was, and when I said "Ella Enchanted" there was a long pause, which I then quickly followed up with, "But I also really love TS Eliot." Took me a while to realize that liking children's literature isn't something to be ashamed of at all, and that asking "What is your favorite book" is a rather snooty thing to do if you're going to judge the response based on the type of book, rather than the person's reasons for loving it. I have absolutely definitely run into that kind of intellectual snobbery, though my experiences were more in film school. I'd be asked what my favorite TV show is, and instead of answering with the socially acceptable "Breaking Bad" or "Mad Men" or "Curb Your Enthusiasm", I always went with the honest but kind of disappointing answer of "Supernatural." So yeah. I know that feel well.